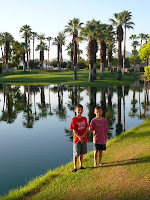 On Saturday, we arrived at Palm Springs for our southern California vacation with Nana and Grandpa. Our resort is very nice, situated right near the swimming pool and right alongside the golf course. Though, the weather seems to be rather warm (over 105 every day), so I don't think we'll be in for much golfing this trip. Sunday had us traveling to San Diego to pick up some discounted tickets for the week at the Navy MWR office on Coronado Island. 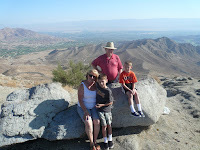 (Since Dad is a retiree, we were entitled to some discounted Military rates.) 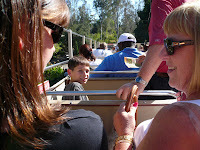 It was quite a drive to get to San Diego this first day, but we saved well over three hundred dollars on tickets, so it was really worth the effort. 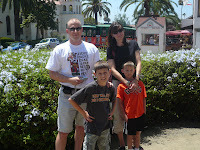 Once we had tickets for the Zoo, Disneyland, and Legoland in hand, we were off to Old Town for lunch. 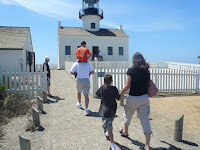 After lunch, we took a refreshing stroll around Cabrillo National Monument to see the Point Loma lighthouse. This is the southwesternmost lighthouse in the USA, and the view of San Diego is spectacular! To one side of the point, all of downtown, the airport, Coronado and the San Diego Bay are visible, and to the other side, the endless Pacific ocean, stretching out unbounded to Hawaii. 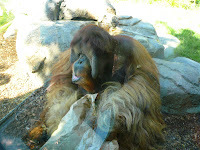 After Point Loma, we drove to Balboa Park to see the San Diego Zoo. 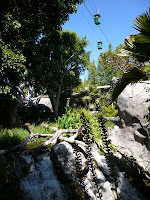 The San Diego Zoo is one of the greatest zoological parks in America. 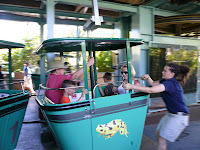 The boys really enjoyed the overhead tram ride, and the weather was pleasant enough that all the animals were out and on display for us. 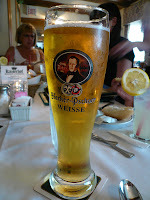 After the zoo, I took the family over to Mission Beach to get some excellent authentic German food at the Kaiserhof restaurant. 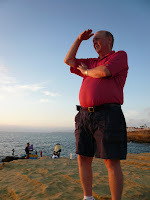 Then, finally, after much schnitzel and beer, we capped it all off by watching the sun set over the Pacific Ocean. 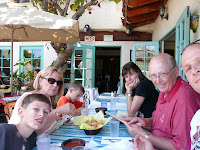 Then, it was a very long three hour drive back to Palm Springs for a much deserved rest after a very busy first day. 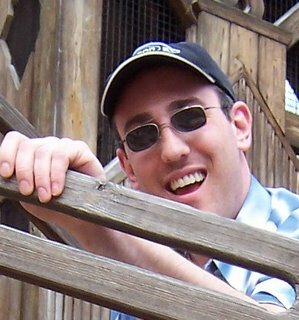 very nice vacation pictures. Looks like you all enjoyed yourself. i know you were just looking behind the ???? ?